The giant Hunter Boot special shape arrived in southern Italy yesterday and was tethering throughout the night at the Polifonic Music Festival. Polifonic is an electronic music festival held on the coast of southwest Italy, close to Monopoli. Debuting only last year, it was such a huge success it has returned even bigger and better and is set in the beautiful area of Masseria del Turco. 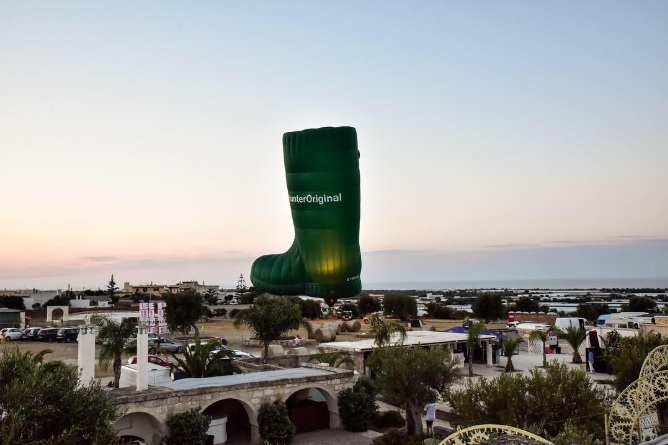 This year’s event also of course saw the addition of our 120ft giant wellington boot, which is a replica of ‘The Original Wellington Boot’ – Hunter’s iconic and globally best-selling boot. Lighting up the area and looking rather impressive, the balloon ‘glowed’ in the early hours of the morning to the delight of the crowds! The Boot has also been causing a stir on the long drive down to Polifonic, having flown in Mondovi in Northern Italy on Thursday and then Todi in Umbria on Friday morning. The balloon will now being its journey back via the Netherlands and Belgium – be sure to keep an eye out for us!